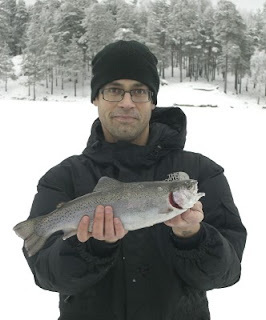 Ed with the first fish of 2010, a lovely ice caught Rainbow Trout weighing in at 1lb 10oz. 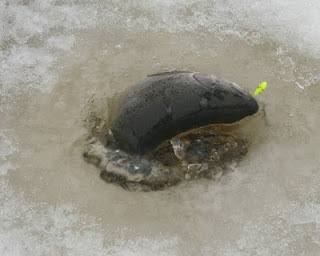 The fish took a maggot baited mormonsk hook whilst it was being jigged in midwater..
A nice day out today, it being the first trip of the year For Ed, Jim, Simon and Al, ice fishing for Rainbow Trout at Nedre Rudan. The lake is rather small, though is a good lake for Rainbow Trout, he lake record here is just over 15lb.! Brown Trout and Char are also present in smaller numbers, the Char being difficult to catch. In summer season the presence of Carp, Mirrors and Commons, as well as a small number of Grass Carp and a head of Tench make this venue very interesting indeed. today though it was Rainbow Trout we were after and Ed duly landed a very nice fish of 1lb.10oz.(3Pts.) after about an hour, a great way to kick off the years fishing. A small Perch to myself was the only other fish taken on a tough day when the fish seemed to be rather inactive, lots of anglers at the lake failing to catch today. As always the bonus points to be awarded at the end of the year for biggest fish of every species that scored on the table, with 12pts. going to each. In addition the heaviest overall fish of the season gets a further bonus of 12pts. Rainbow Trout; Ed; 2lb. 1oz. ; Rudasjön; May 29th. Seatrout; Simon; 1lb. 2oz. ; Strömmen; September 10th. Pike; Ed; 13lb 2oz. ; Dreviken; May 26th. Perch; Ed; 1lb. 14oz. ; Lidingö; May 31st. Bream; Al; 4lb.3oz. ; Tyresö Slott; April 23rd. Ide; Rafa; 3lb. 8oz. ; Dalarna; June. Rudd; Al; 1lb 1oz. ; Lovon; June 7th. Sik; Al; 1lb 5oz. ; Tyresö Slott; April 17th. So there it is folks. 2010 has now begun and the slate is clean again. 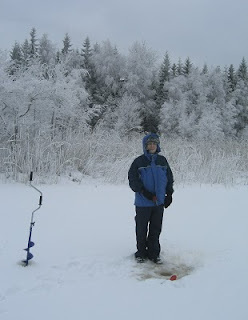 Ice fishing is now a viable option, which i will be organizing in the coming week now that it is safe on the lakes. Hopefully Zander will become a feature this year, possibly also Carp and Tench also. Perhaps also a week fishing somewhere. Thanks for the company guys over 2009, hope you all land a few monsters this year..